Home › Excerpts › Earl Grey, Hot! “Earl Grey, hot!” my husband likes to say as he makes his favorite cup of tea. He’s referencing Captain Jean-Luc Picard’s order to the Enterprise’s food synthesizer on Star Trek: The Next Generation. But is Captain Picard really drinking the same thing as my 21st century husband? Star Trek TNG takes place around the year 2364 (we are assuming it is BCE rather than “star date” – a true fan will correct me) which is approximately 350 years from today. Judging by 350 years ago, food looked somewhat different from the way it looks today. The great Columbian Exchange of agriculture from Old World to New and vice versa was still underway, countries such as the Dutch controlled spices like nutmeg, and Florida did not grow oranges. But even in 1660 if you couldn’t get a Florida orange, you could still find one elsewhere. The real interesting thing is how different certain foods are today. Even more recently we have had surprisingly drastic shake-ups of the food chain. In the 1950s, the top banana imported to the United States was the “Gros Michel” variety. It is a richer, creamier banana but was susceptible to Panama Disease. The failure of the crop crashed the world market. The current banana in grocery stores is the blander, disease-resistant “Cavendish.” You can still get Gros Michels in places that don’t suffer from the disease, such as Thailand. I once ate five bananas in a row on a boat ride in the Philippines because they tasted so unusually delicious. I just thought they were super fresh. Now I know that I was eating an entirely different banan variety. In my own lifetime as a Washington State resident, I have often lamented the fall of the Red Delicious apple. What was once my favorite as a very young child in the early 80s, well, changed. By the 90s I found the skin so tough and the fruit so mushy that it was literally inedible and remains so to this day. Which brings us back to the original question. 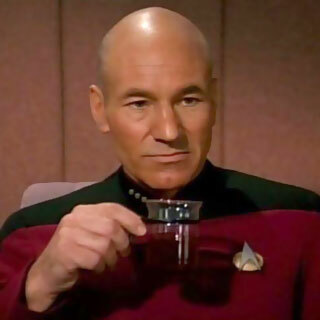 If carrots can change color in a few hundred years, bananas can change varietals in less than a century, and one apple cultivar can trade cheap beauty for flavor in a couple decades, exactly what kind of tea is Captain Picard enjoying in his cup of “Earl Grey, hot”? What do you think? Would we recognize food in 350 years, whether or not it comes from a synthesizer?